Gareth Loudon recently ran a creativity workshop for team leaders, supervisors, foremen and site managers in the construction industry in Wales at the Waterton Centre in Bridgend as part of the Construction Futures Wales leadership programme. Gareth will be running another creativity workshop for aspiring leaders and managers in the construction industry in Wales later this month in St Asaph, North Wales. Gareth Loudon recently ran a 2-day creativity workshop for Prism Medical UK, Equipment Building Services Ltd, RTLS, and ABM University Health Board’s Rehabilitation Engineering Unit at Cardiff Met’s International Centre for Design and Research (PDR) that was organised by Dr. Peter Dorrington. 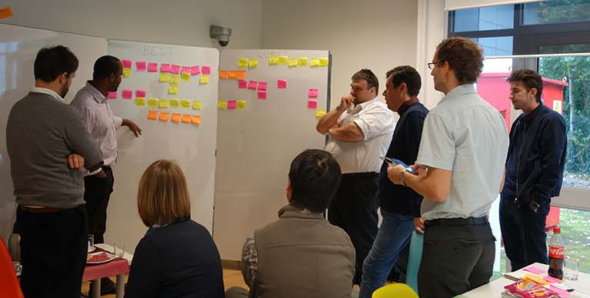 The 2-day workshop was part of a project funded by the UK Commission for Employment and Skills (UKCES) testing new ways to develop skills for innovation in manufacturing. Understanding key factors and processes that affect creativity at an individual, team and organisation level. Learning about important creativity processes and techniques. Applying the key creativity principles and techniques to the challenges facing the companies involved in the workshop, including the capturing of stories from the field and the challenges faced; the generation of new and improved product and service ideas; the synthesis and evaluation of the new concepts generated; and planning for the next steps of the project. The Centre for Creativity has recently been awarded funding from Innovate UK to design, develop and evaluate a new way of using biofeedback of a person’s heart rate to track their own attention and relaxation levels and to help train and improve their levels of relaxed focus, sometimes referred to as ‘flow’ and ‘mindfulness’. The hope is that such a solution could be used to help children suffering from attention deficit disorders, but could have applications in much wider areas of use. The project will run from September 2015 to March 2016. A new piece of research highlights the importance of focusing on the well-being of employees to increase productivity and loyalty. “Happiness works. Happy workers are up to 12% more productive than those that aren’t”. These findings are inline with other research by Dan Pink, Mihaly Csikszentmihalyi and Sonja Lyubomirsky on the link between happiness, intrinsic motivation, creativity and productivity. It is worth reading the Journal article by Sonja Lyubomirsky called Pursuing Happiness: The Architecture of Sustainable Change. In her article she talks about different factors affecting happiness, some that are in people’s control (“Intentional Activity”), some that are related to genetics (“Set Point”) and some that are related to “Life Circumstances”, such as demographics and the effect of certain personal life events. She suggests that we can make a difference to our level of happiness by focusing on “intentional activity” aspects, however she also points out that this requires effort. She divides this “intentional activity” into three types of effort: behavioural (such as exercising or being kind to others), cognitive (such as reframing situations or being grateful) and volitional (such as striving for important personal goals) and provides evidence from a range of research on how each one of the three factors has a positive affect on happiness. However, Sonja Lyubomirsky also argues that the effort becomes a lot easier, and more sustainable and enjoyable, if a person can find meaning and value in the activity. Sonja Lyubomirsky also highlights how “happy people gain tangible benefits” including “superior work outcomes (greater creativity, increased productivity, higher quality of work, and higher income; e.g., Estrada, Isen, & Young, 1994; Staw, Sutton, & Pelled, 1995), and more activity, energy, and flow (e.g., Csikszentmihalyi & Wong, 1991)”. A classic TED talk from 2004 by Mihaly Csikszentmihalyi describing the concept of flow and its relationship with creativity and happiness.